On your way from Wuerzburg to Fuessen you cycle through three of Germany's most enchanting holiday areas Franconia, Swabia & Upper Bavaria. The cycle route runs mainly through gently undulating countryside, at first along the Rivers Tauber & Wörnitz before it crosses the Danube and heads south. Apart from a few pushing sections, most of the route is characterized by gentle climbs, well-made cycle tracks and quiet local roads. Right in the south, the route becomes somewhat hillier. But don't you worry, it is still suitable for any normal bicycle and less athletic cyclist. As all cyclists are different in their skills, we made the experience, that it is better to offer a rate that covers a certain number of days – with the possibility of adding additional days – then to offer a certain itinerary. Send us the mileage you want to cycle per day, which part of the Romantic Road you want to visit and how many days you have and we will offer you a customized itinerary. We are using local, typical tourist & tourist superior hotels and inns, which offer all necessary amenities for cyclists. In the tour rate breakfast always is included. Your luggage will be transferred from each hotel to the next. Please make sure that you store it at the reception latest by 10:00 am. As the final pick up time depends on the number of hotels our supplier has to deliver, we guarantee that you luggage will be at your hotel latest by 5:00 pm. For those of you who do not want to use their own bicycles, we offer you to rent one. These are street worthy all terrain bikes with seven gear transmission, lights & baggage holder. Please don’t forget to bring your helmet, as they are mandatory in Germany and can not be rented for hygienic reason. Please note that if the starting & ending point is not the same, we will have to charge an extra day for the transportation of the bike back to the starting point. In case starting & ending point of your cycling tour is not the same, we offer the possibility (from May until mid October) to bring you and the bikes back to the starting point with our regular coach along the Romantic Road, which offers also the capability for bicycle transportation. In the morning pick-up of rental bikes in city center of Wuerzburg. 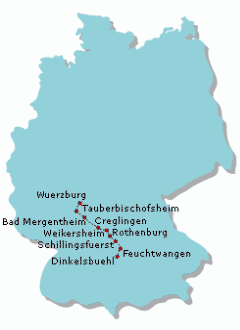 Luggage will be transferred from Wuerzburg to Bad Mergentheim (meeting location and time to be confirmed). Cycling to Bad Mergentheim! Overnight stay including breakfast: Hotel Deutschmeister or similar. After breakfast (and also on the following days of the tour) leave your luggage at the reception desk before 10.00 am. It will be picked up during the day and brought to the next destination. Departure via “Liebliches Taubertal” bicycle path, passing by small, historical villages and beautiful landscapes. 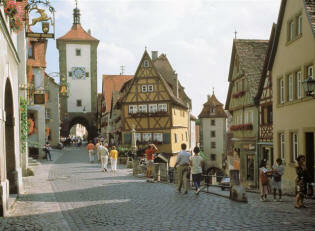 Arrive at Rothenburg, medieval jewel of Germany. In the evening you can join the city walk with the Night Watchman (a voucher is included in your tour documentation). Overnight stay including breakfast: Hotel Schranne or similar. In the morning we are leaving for Schillingsfuerst, whose landmark is the Baroque castle of the Princes of Hohenlohe-Schillingsfuerst. Next stop is at Feuchtwangen, the city where the Court of a Franconian King and a Bendictine Monastery were founded in the 8th century. Overnight stay including breakfast: Hotel Lamm or similar. After breakfast your start for your next cycling day. From Feuchtwangen to Dinkelsbühl the cycling path leads through forests passing many small ponds. After arriving to Dinkelsbuehl, check in at your hotel. In the evening you are invited to join a city walk with the Nightwatchman (free of charge, meeting point at the cathedral / church St. Georg). Overnight stay including breakfast: at the Hotel Goldene Kanne or similar. This will be the last cycling day. On your way from Dinkelsbuehl to Noerdlingen you will follow the Woernitz river for a short while before continuing to the Noerdlinger Ries. Noerdlingen is the only town in Germany, where you can walk the walls and battlements all the way round. The historical town is dominated by the 100 yard high bell tower of St. George church. In the early afternoon (time to be confirmed), you return your rental bikes to our bus driver in Noerdlingen who will take the bikes back to Wuerzburg. Child discount: Until the age of 11 (inclusive) we grant 30% discount on the per person double room rate, when sharing a room with two adults in extra bed. Discount apply for 4 or more passengers! Note: The booking of these hotels is subject to availability. The following rates are not valid during trade fair periods and conventions. Maximum one or two nights before/after tour are available at that special rate.